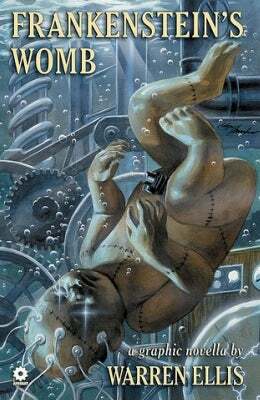 While Fringe tries its best to make comic book science mainstream, comic books are busy reclaiming mainstream science fiction - or, at least, that's the message that we get from the cover of Warren Ellis' upcoming "graphic novella," Frankenstein's Womb. Details about the book are still being kept under wraps, but what we do know is this: it's another of Ellis' "Apparat" imprint books for indie publisher Avatar and illustrated by Marek Oleksicki. We'll see what yesterday's tomorrow has in store for us when the book appears this winter.